159 Votes Please vote for the Quality of this Port / Wrapper, not for the Game or Application! 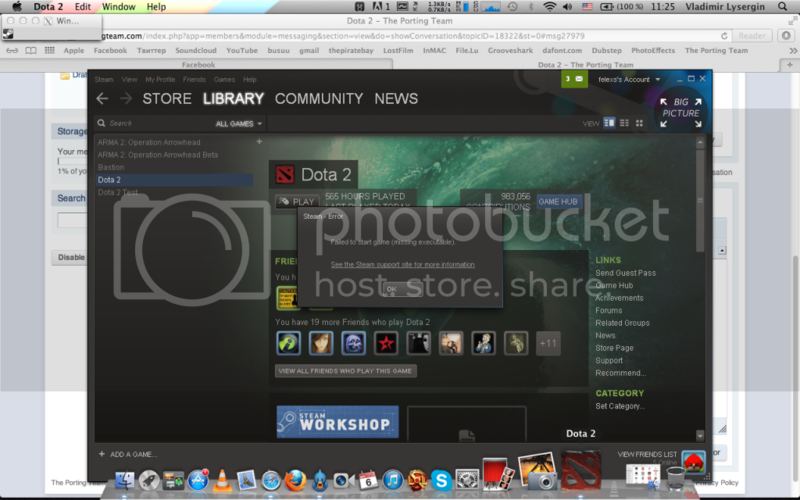 Valve has released their official Mac client of Dota 2 on Steam already. The download(s) for my port are still up though. PLEASE MAKE SURE IF YOU ARE HAVING PROBLEMS DOWNLOADING FROM GOOGLE DRIVE, TRY DIFFERENT BROWSERS, CLEAR YOUR CACHE, COOKIES, ETC. THERE IS NOTHING WRONG WITH THE DOWNLOAD. Dota 2 is an Action RTS game, developed by Valve Corporation. The title was formally announced on October 13, 2010; and is set to release in 2012 by Valve, through both retail and Steam, for Windows and OS X. It is the successor to the very popular Warcraft 3 mod, Defense of the Ancients, which was based on Aeon of Strife map for StarCraft. It will be released as a Free to Play game. Dota 2 is a combination of RTS including perspective and a heavy requirement of tactics and team co-ordination and RPG including itemization and leveling up. The main objective in Dota 2 is to destroy the enemy Ancient Structureinside their stronghold, these strongholds are protected by multiple towers down 3 lanes. The player controls a Hero which fights for them and gains strength by leveling up by getting experience, which is given when creeps and heroes die, and by itemization by buying items with gold. Gold is gained passively over time, killing creeps, killing enemy heroes and buildings. You can prevent the enemy gaining as much gold and experience by denying creeps and buildings. This port had been my greatest success. I have worked on it for months now, and i'm proud to be the porter. Gameplay is smooth for me, with slight graphical glitches (non that are game breaking). Please visit my website at vindictivestudios.webs.com for the latest downloads in the future. All this versions, except bootcamp, does not support my graphic card. Trying this out.Hope this works. IF YOU ARE AN ATI/AMD GPU USER, IT IS RECOMMENDED THAT YOU HAVE THE LATEST VERSION OF MOUNTAIN LION INSTALLED!! YOU WILL EXPERIENCE ISSUES WITHOUT THE NEWEST VERSION OF MOUNTAIN LION!! THE PORT IS RATED GREEN FOR ATI/AMD ONLY WITH THE NEWEST MOUNTAIN LION!! - *Most likely NOT playable on high setting for Shadows and Textures. - *Some users have experienced microphone issues. - Steam Overlay does not work. - *You may experience slight graphical glitches like invisible water (the river in the middle). - Portraits do not appear correctly. * means the issue is dependent on the version of the wrapper you're using or the fact that it is a known issue for some only. Please note that the fixes may not work for you, and i recommend you try all the fixes even though its not meant for your problem (Users experiencing cursor problems had fixed their problems with they keyboard fix). Anyone who is getting missing executable file do following: 1. Right-Click on Dota 2 2. Open Properties 3. "Local Files" Tab 4. "DELETE LOCAL GAME CONTENT" 5. Right-Click on Dota 2 Again 6. "Download Game" 7. Enjoy P.S. You can do same by clicking "verify integrity of game cache"
If that does not work, try the other fixes below. 3. Change Display mode from Fullscreen to windowed (if you didn't change your launch options by adding -windowed). and yes - you have to do this everytime you start the game. Please make sure you are a Beta tester for the game and you actually OWN IT YOURSELF on Steam. 2. Steam might update so just let it. 3. Steam's login window will appear, simply log-in with YOUR account details. 4. Simply install Dota from Steam after logging in. Go to your Library, make sure you are in your Games Library and find for Dota 2, click on it, and press the install button. 6. Rate this port 5 stars (The port will not work unless you do this, jk). It was a great journey working on the port but now, it is not needed anymore. I would like to thank everybody that helped with bugs and problems!! Also, thank you for voting and supporting because this port is now the Highest Rated port on the PortingTeam.com!! I can't wait till this game becomes free. I'll try them out and tell you. Edit, Lunar Blessing is fine. Why would it not? There isn't animation for it i think, but anyways, i don't see a problem. do you have any screenshots? and like does it lag much? Please read through careful, the screenshots had been up since i first upload the wrapper. Smooth gameplay on highest graphic settings the wrapper can take. Oh and the screenshots are in a spoiler, maybe you didn't see. If anyone has a different card, could u test my wrapper for me? Thx! Can u elaborate? You double click the app then that comes up? I'll be messaging you. I doubt its something to do with my wrapper. noup, nothing did... Downloaded, started Dota2.. hmm... i wonder - i had downloaded dota2 through steam earlier so maybe the problem is cause of that. Yes it is! I managed to get that error. Just copy and paste the 'Dota Beta' folder from wherever you had already installed it into the wrapper's c drive. I might upload the wrapper with the game inside installed so to prevent this from happening to others. But the file will be big. can u tell me, where's the dota2 in steam hiding and where i have to put it.... i cant find the files.